Nothing beats the natural beauty of a hardwood floor! With an endless selection of floor species and color finishes to choose from, hardwood always finds its place in any setting. It’s a long lasting flooring solution that withstands the test of time. Many product options include ¾” solid, structurally-sound, easy-to-install click hardwood. 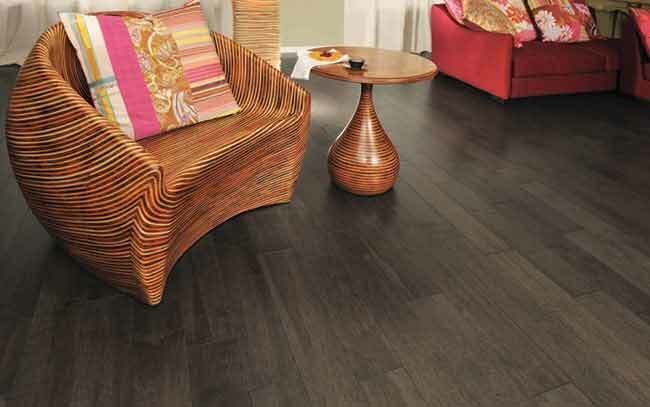 Various thicknesses and plank widths let you consider hardwood for any room in the home. So, why choose hardwood flooring? Its natural strength and timeless beauty that lasts for generations is just the start. Hardwood is perfectly imperfect; as a natural product, the beauty of hardwood comes from the unique characteristics of nature’s creation. Beautiful grains and imperfect marks add to the individual character of the floor, making each board unique so that no two will ever be exactly the same. Durability is another factor. Different species of wood offer different levels of hardness. All species of hardwood are rated on the Janka Scale. The Janka hardness test measures the resistance of wood to denting and wear. Hardwood floors come from the manufacturer either unfinished or factory-finished. Unfinished is also referred to as “finished on-site” hardwood. Finished on-site hardwood allows for more custom colors and finish options than factory-finished, where you may be limited by the manufacturer. Each option has pros and cons that our customers will address with their flooring professional at the time of selection. Different hardwood cuts also contribute to the floor’s characteristics. Plain sawn, or flat sawn, is the most common type of lumber cut. The annular rings are generally 30° or less to the face of the board (known as tangential grain). This type of cut creates a cathedral pattern in the wood on the face of the board. Quarter sawn wood has beautiful straight grain patterns. In this type of lumber, the growth rings intersect the board face at a 60-90° angle. The name is derived from the fact that each log was sawed into four quarters at the sawmill. In red and white oak, this type of cut creates a striking “fleck” appearance. Rift sawn wood can be cut to pair with quarter sawn, or it can be cut as rift sawn, where the annual rings are 30-60°, with 45° as the optimal angle. This type of lumber is manufactured by milling perpendicularly to the growth rings, creating a linear grain pattern that has no flecking. Rift sawn lumber is dimensionally stable and offers a unique look, but this method also produces the most waste, which increases the cost. View a gallery of all wood floor species.